Yoon Woo Jin played his troubled character with such aching vulnerability and tragedy all the way to the end of Arang and the Magistrate. Sung Dong Il was the best dad on any Korean drama this year with this funny and moving take in Answer Me 1997. Kim Bum can do no wrong in my book and he does his perfectly angelic child-like thing in Padam Padam. Hoya is restrained and subtle with a secret in Answer Me 1997. Few characters in drama this year gave me more laughs than Choi Siwon in this funny, meta-commentary drama. While the extension definitely bummed out the last few episodes, Choi Siwon was a consistently great actor with his perfectly blank expressions and his great comedic timing. He’s so athletic and proficient with his body language that it adds to the ridiculousness of Kang Hyun Min. 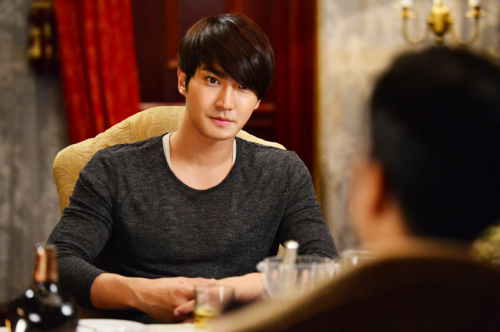 Hyun Min is written as a dunce but Siwon adds layers and layers to his character’s easily hurt pride, materialistic desire for more money, and ultimately (but unsurprisingly) his desire to be a better actor. You can tell Siwon is having fun with this role and as a result, the audience is as well. Best scene: Too many moments to count but clearly all the playful antagonism with Min Ah while filming counts as one of them, no? Faith is such a baffling misfire: it clearly had goals and ambitions of becoming so much more epic than the final product but it did provide me one great performance to admire. Ryu Duk Hwan is not a name I am familiar with but thanks to his wonderful take on sensitive King Gong Min, I need to pay attention to him in the future. 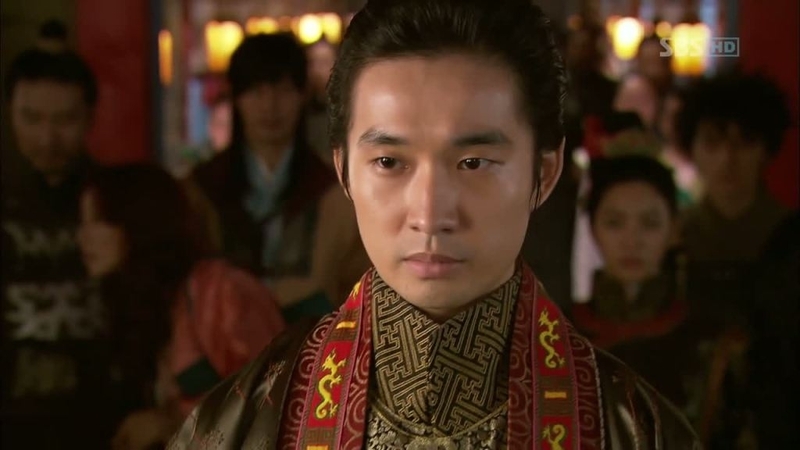 Gong Min has a low self-esteem, given his background growing up in China and set up as a chess piece for the Chinese. But with Choi Young’s help and assurance from his queen, Gong Min grew into an intelligent king, able to let people into his circle. It’s easy to make Gong Min seem like a whiny and obnoxious king, but Ryu imbues so much vulnerability that the king doesn’t come off as such.Ryu did such a wonderful job of charting his trajectory: his fears, insecurities, and ultimately his faith in Choi Young. History of the Salaryman stayed with me all year and that’s in part thanks to the stellar story and cast. Of particular note is Jung Gyu Woon’s funny, menacing, and sad take on Cho Hang Woo. Our initial introduction to Hang Woo suggests that he’s a villain—a conniving if intelligent businessman who attempts to steal a rival company’s product. But as the show evolved, we learn more about Hangwoo and his past and motivations. Jung is so smooth and calm when he’s doing his business dealings and there’s an irrepressible sense of confidence in his walk, his stance, and his speech. But when faced with Woo Hee, his true match and love, he suddenly gets struck with an awkwardness that is so unlike him. Jung is so funny in these scenes with Woo Hee that it illuminates us on a different side of Hangwoo, one that takes surprising turns by the end of the show. Ultimately, Jung makes what seem like such a hateful character into a complex, outright funny, and wonderful person. Best scene: In prison, while Yoo Bang interrogates him, the mention of Woo Hee all but destroys his calm, confident bravado. Here’s a performance that deepens with time and gets better with each viewing. The King 2 Hearts is a show I watched multiple times because I wanted to see the hilarious bromance between Shi Kyung and the king himself. But while Lee Seung Gi amped up the emotion and tension, Jo Jung Sook grounded it with his dryly funny Shi Kyung. Shi Kyung is loyal to his king and the South Korean government and uber-serious about his role that it becomes farcical and hilarious. But it also shows his competent side and adeptness at handling the job. Like Hang woo, however, he becomes all kinds of awkward when it comes to the girl he loves, Jae Shin, and I love that the same seriousness he employs in his job becomes such a hindrance to him here. Despite my feelings about the tragic ending, Jung sook played his character with proficient comedic timing and small tics that built up into an earth-shattering (at least my earth) ending that broke my heart multiple times. Best scene: That posthumous video for Jaeshin outlines everything I love about this performance: the gentle warmth, care, humor, awkwardness, and love mixed with the devastating knowledge that he’s gone. It kills me every time I see it. Gaksital was definitely an interesting experience. There were times when it slowed too much and there were times when it went by so fast I must have missed so many things flashing at once. But despite that, what kept me constantly watching were the performances of this show and Park Ki Woong certainly deserves all the recognition he is getting for playing Kimura Shunji. What makes Shunji a potent character is that we watched him grow from a loving and bright teacher into a monster-like figure out to kill Gaksital. Throughout this, Park delivers such a nuanced take, sometimes going over the top but never to the point of caricature. Sometimes, especially as we reach the ending, it is the tiny glances that let out a glimmer of the Shunji we used to know that hits us. Park manages to be both frightening and saddening at the same time because he played Shunji with such warmth in the beginning but sheds all vanity to play the tortured soul we encounter in later episodes. Nevertheless, Park was unforgettable in this role—truly one of the best performances of the year and the best in this category. Best scene: A later episode where he wishes that all of this will end so he can go back to who he used to be and love Mok Dan. Tragic in all senses of the word.